... which might actually be precisely the reason they did this in the first place . I suspect play-testing revealed that Wizard armies were somewhat too weak, lacking in offensive capabilities and rectified this by increasing the odds of gaining Attack instead of Spell Power. That may be so. However, now, I see no reason why we should refrain from making their scaling fit the class archetype. 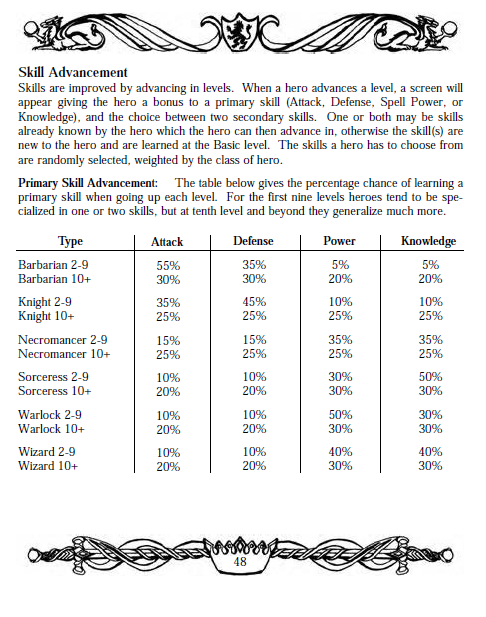 In fact, bearing in mind that the HOTA team intends to balance magic heroes, I think that Wizards, particularly, should have their scaling corrected first, then we'd move to make the neccessary adjusments (starting skills, specialties and even the troops, according to the reason you gave) and not the other way around. Edited by just0 at 19:28, 24 Mar 2018. I suspect play-testing revealed that Wizard armies were somewhat too weak, lacking in offensive capabilities and rectified this by increasing the odds of gaining Attack instead of Spell Power. Another possible reason is that they wanted to show that Tower was more about the pursuit of knowledge rather than power. 20/20/20/40 would have been overkill though as wizards are almost guaranteed Intelligence. So they put it in attack instead. Interesting line of thought, but they already have Wall of Knowledge for that matter. Anyway, do you agree with me that changing it to the standard 20/20/30/30 would be better? Interesting line of thought, but they already have Wall of Knowledge for that matter. Their grail structure also provides 15 knowledge. I think that is just Tower's theme. Knowledge, knowledge, knowledge and more knowledge. So I can understand if that was their reasoning. While it would seem to make more sense for wizards to have more spell power than attack, I am conflicted in wanting to change to 20/20/30/30 because it would no longer differentiate their knowledge growth from their power growth. Perhaps we could say, as the wizards get older they become satisfied with their levels of power and begin to branch out and learn to use their staves in the pursuit of combat knowledge. So, they have equal chance to get sp and know after level 10, even though they are clearly more focused on spell power. Also, their grail structure is also focused on spell power. Again, thematically, it makes no sense for wizards to scale so oddly � I come back to my counterexample, imagine if barbarians were to get more sp than attack after level 10, everyone would urge for that to change, it is conspicuously absurd. Not everything is always cookie cutter. I imagine the devs didn't just want mirrored opposites everywhere. The bit about wizards becoming satisfied with their level of power and seeking to gain combat knowledge with their staves gives them more flavor. I think Maurice made the correct remark � it is a balance question. And it is not about mirrored opposites, almost all of the magic heroes scale 20/20/30/30, and only the wizards have such an odd advancement after level 10. Therefore, I stand my ground, it should be corrected. Edited by just0 at 21:57, 24 Mar 2018. Necromancers, battle mages, and elementalists are all 25/25/25/25 after level 10. Balancing may very well have played a role in their decision. It could have also just been some sort of mistake. However I don't feel particularly strongly about changing anything and I'd rather just say the wizards grow satisfied with their power levels and begin to branch out and seek combat knowledge with their staves. To bring in your namesake, it could have also been a reference to the Lord of the Rings. Gandalf used a sword. Edited by Gandalf196 at 18:13, 26 Mar 2018. Balancing may very well have played a role in their decision. It also could have just been some sort of mistake. However I don't feel particularly strongly about changing anything and I'd rather just say the wizards grow satisfied with their power levels and begin to branch out and seek combat knowledge with their staves. See, that's what I am talking about, a reasonable table, which should have only been expanded, not distorted (in the, possibly only, case of wizards). I have no objection to these values, they fit the lore and are very very reasonable. Edit: I extracted HCTRAITS.txt from Heroes III Data folder and uploaded it. To bring in your namesake, it could also have been a reference to the Lord of the Rings. Gandalf used a sword. Gandalf is not a wizard in the traditional sense, despite his attire, he's a Maia, a spiritual being embodied as an old wise man. His phyical prowess is not due to training; he's simply not human. Edited by Javiduc at 14:09, 25 Mar 2018. I like to play big random maps and as a father I have little time so I have to save and resume each match for several days or even weeks. Sometimes, i forget where is the other end of a two ways monolith and it is quite annoying to look for the whole map to find where it is. Is there a better way to find it? If not, I think it would be a good improvement for future Hota releases. Maybe it would be good too, if there were a control in the custom map men� to ban or reduce quantities of two/one way monoliths. Edited by OrrinIsTheBest at 20:20, 25 Mar 2018. Quote from wiki: " While Wizards may lend little to the direct military aspect of a battle, they are likely to turn the tide in their favor with the use of mighty arcane forces." I have a question regarding hota - will there be an increase in the number of players from the standard 8 with new flag designs and colors? (I mean, with the addition of Cove, Forge and other factions, it would only seem right ) I know I've seen pictures somewhere with over 12 teams on maps, black and white players etc, but I'd like it possible in hota too . If not, is there some mod that adds this option to the game and editor that won't break hota in the process? I never suggested this cause I thought it to be impossible but, if more players can be added, could more heroes be added too? While limited number of players doesn't appear to me as a problem, except cause one can't have all factions in the same map, Giant maps could be made faster by an increase in the number of heroes one has available. Edited by phoenix4ever at 09:18, 26 Mar 2018. I don't like Wayfarer's Boots in HotA, they ruin Pathfinding and we already have Angel Wings, Expert Fly and Cove's grail for that. Maybe you could rework the artifact and make it Nomad's Boots or Sandwalker's Boots instead and only remove penalty from sand and maybe move it from major to minor?, that way Pathfinding would still have some use. That is what the devs are aiming at � balancing magic heroes, so that they can be main too. My proposal is specifically for the wizards, because I feel they're by far the most wronged of the bunch (that dreadful scaling after level 10, bad starting skills, bad specialties, in this order). They would be compensated later in the series: in Heroes IV, Mages would be the masters of the mightiest school of magic, Order, in Heroes V they would be the maestries of magic (the most magic-focused class in the game) and in Heroes VII they would have a unique skill, Metamagic, to improve their magic in a way the classes from other factions couldn't dream of. Edited by StrikerX at 19:21, 26 Mar 2018. Some suggestions for the Hota Template Editor. - Is there a way in template editor to allow us to set creature guards to 'Savage' instead of Hostile when map gets created. The super rich zones which have tier 7 guards guarding relics end up joining the AI way to often. First time I met an AI on Huge/Giant map he had 5 stacks of 50+ tier 6 and 7 troops. Relics are too powerful to have the guards joining them as well and I don't care for diplomacy secondary. As far as I know in map editor you have to set each individual guard to savage? - When setting up zones with towns / castles not in the same zone as my starting zone is there any way to get an option like in the 'Allowed towns' section that would say 'Same as Player' and have something like a dropdown box to pick a player? I know there is the 'All towns/castles have same type' box but that only works if they in same zone. If I want a second castle semi close to my starter castle but in separate zone and to be same type as player I can't figure out how to do this without setting it as a 2nd starter town of that player where they get it automatically at start of game. Also we could make maps with castles/towns more balanced instead of random amounts or none at all for some towns at least for 2 towns for each faction. A secondary option as well would be to have some way of tracking each town type that is created and making sure they are spread evenly so they could still be in random places each time. I like them even though I rarely use them just for the choice of having them if I don't have pathfinding on a certain character (mostly a secondary collector/runner) then I give them those. Otherwise if I got pathfinding then I use boots of speed instead. I will still most times choose pathfinding for the boost of having boots of speed and less penalty. Edited by just0 at 18:59, 26 Mar 2018. It would be nice to have a way to see creature turn order in combat. Either a popup set to a hotkey, or maybe a priority number in each troop infobox. Although the popup might need coordinates or something to differentiate same name troops. All of these posts and no mention of to what version the mod. is at now. HoTA is now at version 1.5.3 officially as of last week. A few days anyway. Did not play an RMG map just yet but, did play the newest one that came with the mod's upgrade and, wonder if the modder included the option that the A.I. players can be rather offensive or defensive according to its position on the pre-made map by the modder or a fellow co-modder of HoTA. First week of month 3 on a medium sized map with an underground, one of the surface factions(notibly the conflux one), had amassed very close to a whole thousand(1,000) troops in its own city garrison. When I saw that, I auto. declared myself winner by cancelling to resume the map and, by having 5 cities to my name already but, will not be able to stop such a Juggernaut of an army, once that specific A.I. player launches its unstoppable onslaught of invasions. Please note, that the game TurboRisk had an A.I. trait of a personality that acted exactly the same way. Gathering well over 140 armies and, once it launches its non-stop attacks, it auto. wins the game by literally owning every single territory on the face of the Earth/Map/Board. Just knowing that you have to search and destroy such A.I. player with extreme prejudice, is truly ruining my fun at playing such classic of a world conquest of a strategy game.